A unique Winter experience, explore three different canyons, each with special highlights. Select from the tours below. 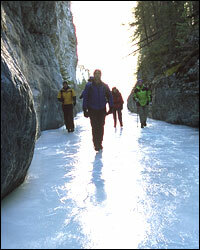 Trek across frozen sheets of ice in the canyons of the Canadian Rockies. Banff Travel offers ice walks in Johnston Canyon and Grotto Canyon that will allow you to see how these formations were created by ice movement. The history of the Canadian Rockies will come alive before your eyes as you wander past Native art, contorted rock formations, and geological wonders. Participants can also choose to take a night ice walk in which you will warm up by a campfire after exploring the shoreline of Lake Minnewanka. Guests should dress warmly for all of the ice walks and bring a hat, gloves/mittens, and warm boots. Ice cleats, ice poles, hot chocolate, and a light snack are provided by the experienced guides. We are the official leader of providing first rate Banff Activities and Seasonal Tours to our clients. Where ever you are, Banff Travel is here to help you with any question or concern. We make it our priority to give you the best customer service anywhere. And that is our guarantee! If you have a specific question, idea, or would just like to contact us, please use the form below. Allow us 24 hours to respond back to your question. Thank you and enjoy the Banff Travel experience! ATV Tours in Banff & Jasper. Raft Banff & The Kicking Horse! Book Airport and shuttle to Banff/Lake Louise & Jasper. What a Rush! Book Discount Zip Line Tours Here. Book ALL your Jasper Activities here! Save Big! Book Early Bird Golf Packages Here. See the Canadian Rockies with a Banff Helicopter Tour.